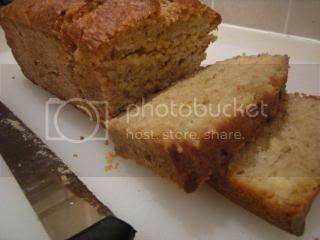 My partner adores banana bread, but it’s horribly expensive to buy (out here, anyway – perhaps it’s different elsewhere), so for the past few months I’ve been working on a recipe for it. This was originally based on a Delicious magazine recipe. But, like always, it didn’t stay that way for long. In fact, I’m not entirely certain it even started that way, now I think about it. As a diabetic I tend to shy away from these things, they’re generally very high in sugar, and the low sugar ones are dry, flavourless, and tough. This one, however, uses only half a cup of sugar (which is still not great, but it’s not as bad as some!). What makes it truly awesome though is the yoghurt and the buttermilk for lightness, and the pureed apple for a lovely sweet tang. Buttermilk is almost like a magic ingredient in baking. It reacts chemically with the baking powder (either added, or the baking powder in self-raising flour) and creates a fabulous light and fluffy texture. 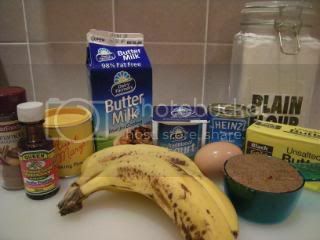 I use buttermilk almost exclusively in my baking now – don’t even dream of making a chocolate cake without buttermilk! And it freezes well too: once you have the carton, use what you need in the recipe, and then just throw the carton in to the freezer for next time. 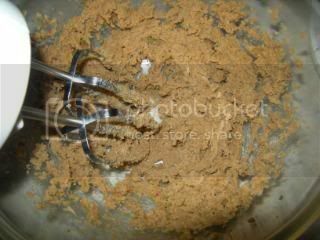 You can also use it for crumbing meat, so it’s not just for sweet dishes. 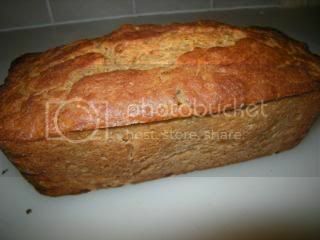 The final product of this recipe, however, is a very light, crumbly bread. The dominant flavours are the banana and the cinnamon. 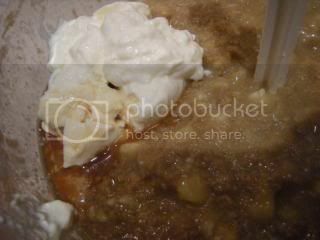 It’s not overly sweet, relying on the fruit (particularly the apple) to add the sweetness rather than the added sugar. Just lovely warm from the oven, or the next day toasted with butter. You can also wrap the slices individually in glad wrap and pop them in the freezer for later. OK, this looks like a lot of ingredients, but it’s all in pretty small quantities: cinnamon (make sure you’re buying ground cinnamon, and not cinnamon sugar); vanilla essence (again, make sure you’re getting real vanilla, not imitation vanilla); baking powder; buttermilk; plain yoghurt (often labelled as ‘natural’); stewed or pureed apple (this time, I’ve used baby food, just look for the one that is 100% apple with nothing else added. 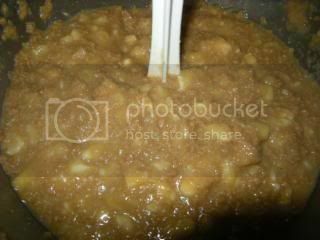 In the past, I’ve stewed my own apples in water – peeled and cored – without adding sugar, and then put them in the food processor. 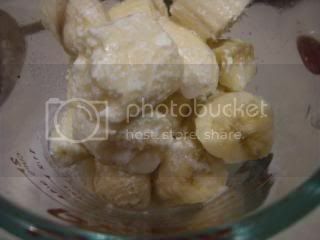 If you decide to do that, freeze whatever you don’t use for next time); plain flour; unsalted butter; an egg; brown sugar; and – of course – bananas! I’ve got three here in the picture, but they’re small ones, and I ended up using four. The riper the better. This recipe works best if the ingredients are at room temperature. That means getting the egg, the butter, the yoghurt and the buttermilk out of the fridge a good few hours before you start. Don’t stress if you can’t manage that, though. It will still all work … promise! First of all, put your oven to preheat at 170 degrees. 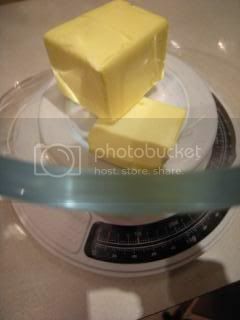 Then weigh out 100g of butter into a medium sized bowl. If the butter is not very soft, just pop it in the microwave for about 20 seconds. This will soften it up (and probably melt it a little in the middle), but won’t turn it into a puddle in your bowl. 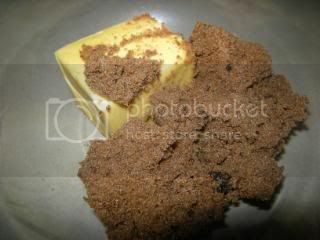 Add half a cup of brown sugar on top of your butter. I’ve actually used dark brown sugar here, as I prefer the more caramelly flavour, but ordinary brown sugar will work just as well. 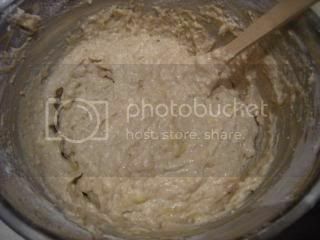 Grab your beaters and give it a good whizz, until the butter and the sugar are creamed, and the colour has lightened. 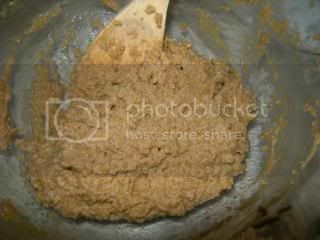 To try and avoid getting little bits of brown sugar all over the kitchen, use a wooden spoon or your fingers to mix it together a bit before you get the beaters in to it. 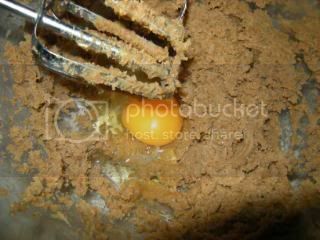 Throw the egg in to the mix and beat it in too. Not for too long – just until it’s all mixed in evenly. Bananas! Now, I’m doing this in my jug, but you could also do it straight into the bowl you’re using, too. Either way, it’s a good idea to sit it on some scales to help guage the amounts you need. So, peel the banas and remove the veins, then break them up into bits. Ideally, you want about 350-400g. These are small bananas, and it took four of them. Throw some buttermilk over the top. If I had to give a measurement, I’d say about a quarter of a cup. 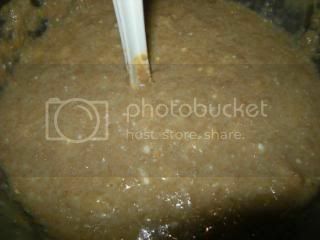 Then scoop some of the pureed apple in as well. Look at your scales – you should be up to around 430-450g by now. If so, that’s perfect. If not, add more banana/apple/buttermilk until you are. 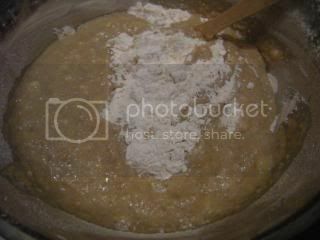 Throw it all in on top of the butter and sugar mixture. And whip out your potato masher! 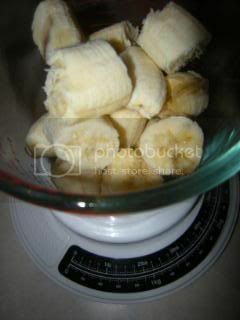 Break down all the big lumps of banana … obviously the older your bananas the easier this will be. Mine were still a little too fresh. 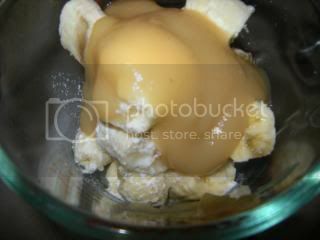 Don’t stress about those small lumps, those little gooey lumps of banana are my favourite bits in the finished product. Chuck the tub of yoghurt in (125g), and also throw in a capful or so of vanilla essence. Mix it all together. It should be looking truly awful by now. 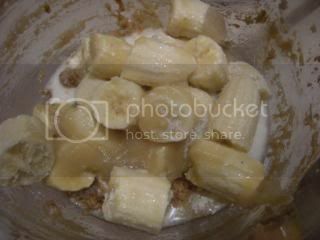 Sloppy with gooey chunks of banana. All together now … ewwwwwww! 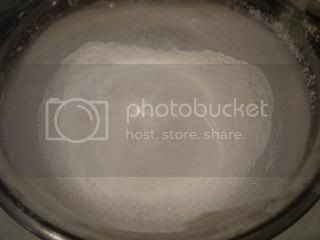 Grab a bigger bowl, and your sieve. Measure out 1 and 2/3 cups of plain flour, a tablespoon of baking powder, and a good dose of cinnamon (I dunno, a teaspoon or so. Man, I’m not good with this measuring business!). Sift it all through. Don’t mix it up, though, or you lose some of that air we just put in there. 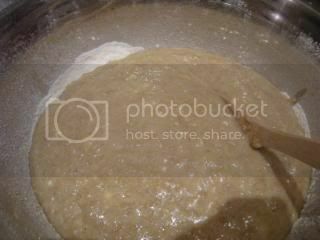 Add the banana mixture on top of the flour. And fold it through. My daughter loves folding mixtures together, she goes “Arooooouuuund and … flop!”. You do need to fold this one, rather than mix it, for a couple of reasons. 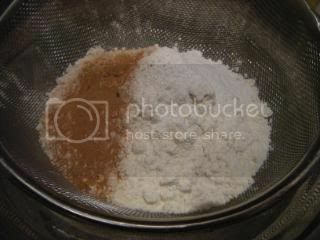 The main one is to preserve the airiness of the flour – mixing or beating removes the air, folding can help increase it. Also, you want to prevent over-mixing the ingredients, you want them just combined, so that you don’t compromise the flavours, and so that it stays as light as possible. 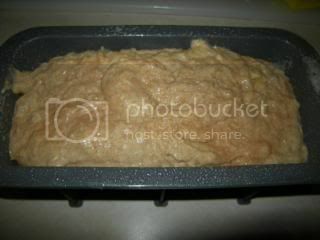 Grab your loaf tin, and give it a really light spray with some canola oil. The silicon baking forms work really well for this recipe. If you’re using a metal tin, I’d be inclined to line it with baking paper, leaving the edges hanging over, and then give it a light spray. The baking paper overhang gives you something to hang on to when you’re trying to get it out of the tin later on. 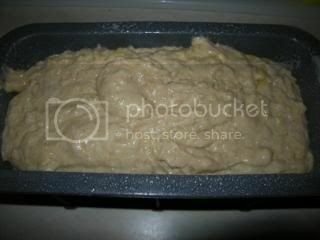 Dribble it all into the loaf tin – no need to be too fussy about the look of it, just get it all in there. 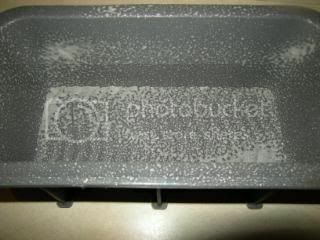 Try not to knock the bowl or the tin around in the process, again, to preserve our air bubbles. Give it a light sprinkle with some more cinnamon (can never have too much cinnamon! ), and pop it into the oven. It will take about an hour, possibly a little longer at 170 degrees. Leave it to cool in the tin for 20 minutes or half an hour (if you can wait that long! ), and then turn it out onto a clean board. Then you can use your bread knife to cut ‘er up. When the slices are completely cool (if there’s any left – mine disappears while it’s cooling), store them away in a plastic container in the fridge, or wrap them in plastic wrap and stick them in the freezer. 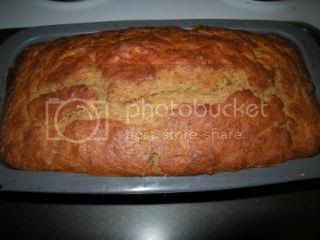 Pictures are in the Banana Bread Photobucket album. Oh, and don’t forget to vote on Slow Food Adventures new domain name either! 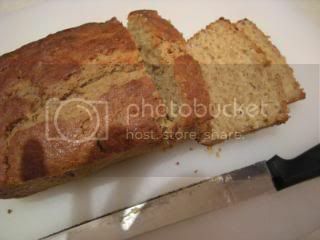 Categories: Recipes | Tags: recipes | Permalink.